Normally, when a person thinks about Moscow the Red Square, huge residential block buildings, tacky cafes with copious amounts of golden décor and karaoke & shisha bars first come to mind. But Moscow’s changing and it’s changing fast! Gone are the days of searching for fun, interesting and non-standard things to do. Now they come and find you where you least expect it. Summer is that time of year when new unusual places popping up is most noticeable because Muscovites have become well-travelled and now know what kind of cool things city-dwelling Europeans get to enjoy so places are beginning to cater to that. For example, there are now several places in and outside the center where you can roll out your beach towel, slap on some sun block, kick back and get some nice color after the long winter. Olivkovy Plyazh (Olive Garden) in Moscow’s gorgeous Gorky Park is located right on one of Moscow’s most beautiful embankments and is a lovely café/restaurant that has everything to create a true feeling of a summer resort: tanning beds, white umbrellas, delicious icy beverages and a fresh breeze. During the day guests bask in the sun and freshen up with the finest lemonade and later on, lounge music can be heard under the beach’s olive trees and a DJ plays from 18:00 to 22:00. 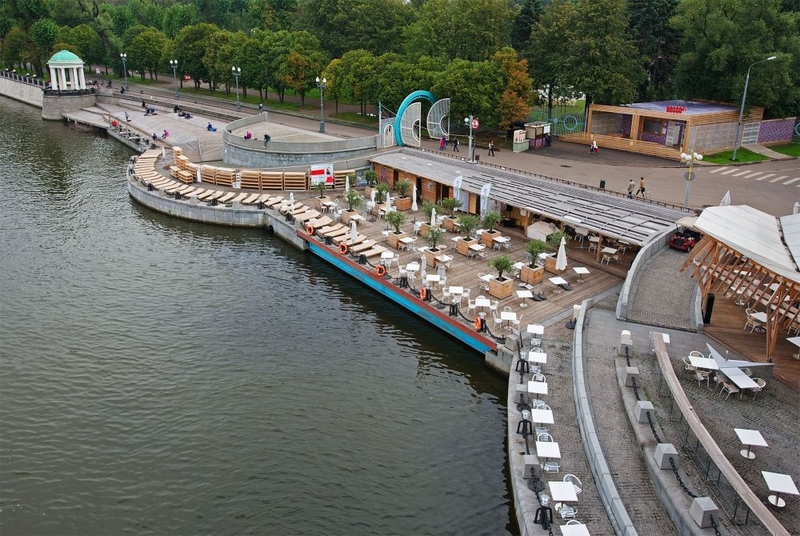 This year on “Russia Day” (12th of June) the city council gave Muscovites a very special present: the National Exhibition of Economic Achievements (VDNKh) launched a unique urban beach project called VDNKh Port. The 1.5-hectare area consists of four swimming pools, chaise longue seating, a spa, four volleyball courts, a workout area, a stage and an LED dance floor. A very stark contrast to the VDNKh we all grew up with where there was nothing except for shashlik stands and cafes with big red Coca Cola umbrellas! Though it’s a bit of trek, Shorehouse’s pool and beach are really worth it on a beautiful hot sunny day. Located right next to Crocus City Hall, transportation links are pretty good and you get a view of Moscow River with yachts passing by as you get your bronze on in maximum comfort. There is everything to make it almost seem like you’re not in Moscow but rather in a faraway seaside resort: a big pool, beach chaise longues, umbrellas and, of course, a bar and kitchen to keep your thirst quenched and your appetite satiated. 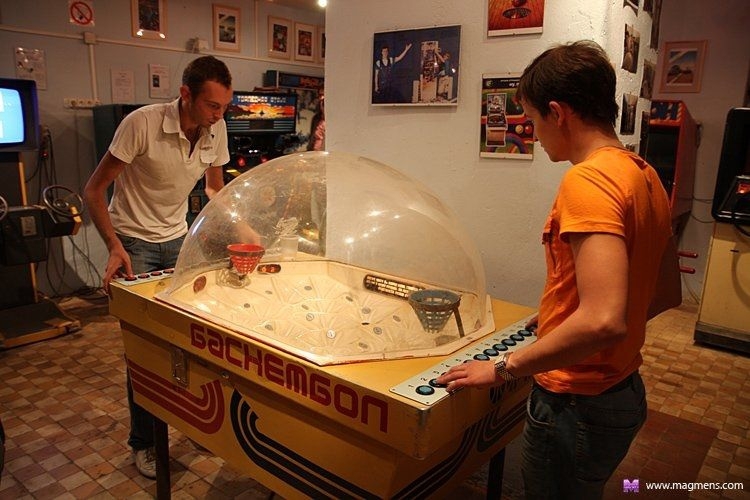 At a depth of 65 meters below ground level and just a few minutes’ walk from Taganskaya metro station, you can play spy games or strikeball at the Cold War Bunker Museum. Individual and group tours can be organized around the huge underground space and unusual architecture of one of the most strictly secret underground military facilities of the USSR. Believe it or not, some couples even see some romance in the potential of WW3 and plan their weddings here! Just a few years ago former industrial complexes were just that: abandoned old factories populated virtually with nothing more than tumbleweed. Now, the former chocolate factory on the island in the middle of Moscow River right across from Christ the Savior Cathedral is the Red October party and arts district, Artplay, once a tea factory, has now become a hub of artistic activity and Flacon used to be a glassworks manufacturer but that has now become a colorful urban space dedicated to the more creative ends of the business spectrum. The iconic red-brick Krasny Oktyabr’ (Red October) chocolate factory transformed into something quite unusual to Moscow – a bohemian island of art, fun and culture, comparable to hipster paradises like London’s Shoreditch area or New York’s East Village but with a twist of Moscow glamour. Chocolate production moved out in 2007 and an art-cluster of hip bars, trendy restaurants, contemporary galleries, happening clubs, clothing and bric-a-brac shops and other artsy joints moved in. Some of the more prominent tenants are Strelka Institute (prominent arts & education establishment slash trendy bar), the Lumiere Brothers Center for Photography , Bontempi (the perfect place to have a pleasant business lunch or a romantic Italian dinner with stunning river views), authentic Georgian cuisine at Mizandari, a refined wine restaurant Primitivo and party places like Gipsy, Shakti Terrace and Rolling Stone Bar. It’s also home to Kino House, Russia’s first ever anti-cinema where you pay for the amount of time you spend watching movies in one of the well-equipped cinema rooms with your friends. You can even bring your own snacks and beverages! Several years ago Artplay moved into the ex-industrial space a few minutes’ walk from Kurskaya metro station and has since managed to breathe new life into it, providing shelter for young Moscow galleries, artists’ studios, cafes, bars, bookshops, a music club, a design school, a cinema, children’s art studio and much more. You can learn (The British Higher School of Design, the Moscow Film School, the School of Computer Graphics “Scream” and the School of Architecture “MARCH”), immerse yourself in culture and art, work at the Co-Working Station, eat and drink (Edward’s Pub, Art Clumba, Il Giorno, Bufetrina) and then party the night away at Rodnya, rooftop loft for architecture and design, gallery and a lecture hall during the day and a bar/club at night on weekends. Flacon: One part of its area functions as office space for media groups, PR agencies, design bureaus and art workshops. The rest of the factory buildings are filled with attractive little boutiques selling unique clothes and accessories by local designers, cafes and bars, large temporary exhibition spaces and small private galleries. There's usually some kind of event going on here most weekends such as flea markets, garage sales, concerts and charity fundraisers. Getting away from the hustle and bustle of the city during the summer months used to exclusively entail going to the dacha. Now, there are a lot of unusual and fun places for the whole family outside the MKAD (Moscow ring road). If you've fallen in love with farm produce, which is so fashionable right now - or if you just want to take a break from the city, get back to nature and breathe some fresh country air, why not try a taste of agritourism? 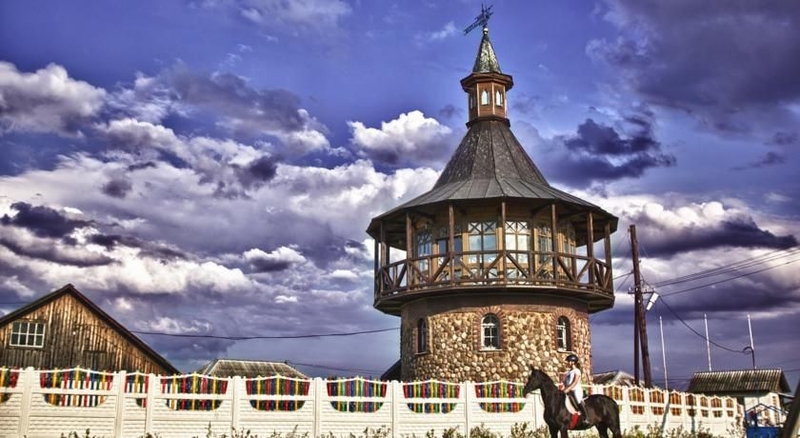 A great place to do this is at the Bogdarnya Agricultural and Touristic Complex. Located in picturesque countryside and forest about 120 kilometres east of Moscow, the 400-hectare riverside property provides the chance to experience life on a real, working farm. Here you can learn all about meat production from paddock to plate, watch cheese making, milk the cows, pet the goats, feed Boris the boar and enrich yourself with other forms of educational "agritainment". Bogdarnya also provides a wide range of recreational activities, including horse riding, quad biking, fishing, canoeing, hiking, paintball, hiking and more. The complex also hosts children's camps, career guidance programs for school students, plus corporate events, training and seminars. Russian holidays are celebrated in fairytale folksy fashion with traditional costumes, music, dancing and much good old-fashioned merriment. On a more romantic theme one can also arrange a ride in the forest using one of their horse drawn carriages, or sleighs in winter and have a picnic around a fire with samovar, gluxvin and shashlik. Get in touch with your inner hippy and become one with yourself, others and nature at Etnomir - the largest Russian Ethnographic Park. Spanning a total area of over 10,000 square meters, including ethno-yards of 252 countries and about 40 ethno-houses constituting ethno-yards of different peoples of Russia and the world, Etnomir offers excursions and master classes in ethno-yards for a full immersion into the different cultures of the world. Although the park is open all year around, the best time to visit is, of course, summer because this is when you can enjoy events such as “World of Taste” (festival that will have foodies spoilt for choice with cuisines from all corners of the globe), Latin American Festival, the Kite Festival, “Vegfest”, Ice Cream celebration and the Festival of Ethnic Fashion and Dance – all self-explanatory! And all this just 110km out of Moscow near Kaluga.